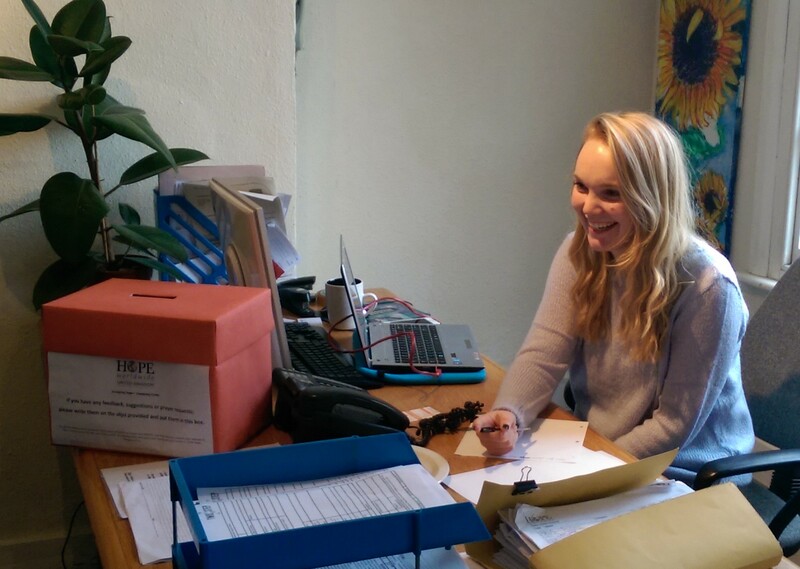 Sarah is a 19-year-old student doing a work placement for a term at our Homeless Services, Two Step. The main part of my day is carrying out assessments with our clients; the maximum can be six a day. I also call clients and people who want to make referrals to us; I make sure they are eligible and book them in for assessments. What have you liked about your placement at HOPE? I really appreciate that I can help people; it’s especially rewarding when you see clients who are really grateful. It has been interesting meeting people really different to me who are from completely different walks of life; each client you see has a different story and has become homeless for different reasons. I also love the people that I work with; we are all very like-minded in how we really want to help clients. I was drawn to work for HOPE because of its ethos; it is an experience that has helped me to incorporate my Christian faith into my work. What advice would you give to somebody who would like to volunteer? I would definitely say ‘do it’ because you learn a lot. I feel like I have been invested in. 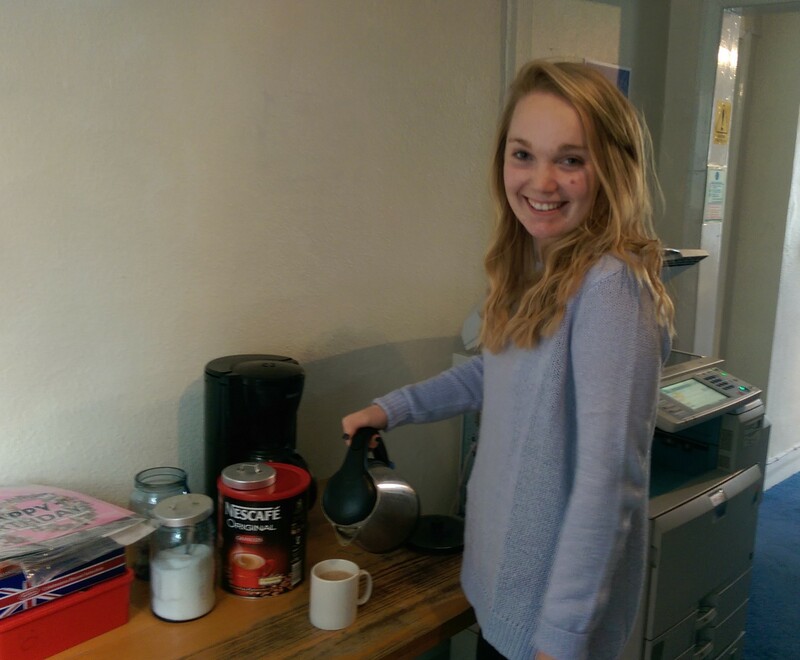 To be a friendly face and give a cup of tea to a client is a good thing for volunteers to do. There is always something that needs to be done; whether it’s calling people, making tea or doing errands. How has volunteering changed your perspective on life? It’s definitely made me a lot more grateful about what I have because it’s easier to stay grateful for what I have when I speak to people daily about what they don’t have e.g. the lack of friendship in many clients’ lives. It’s also changed my view of people on benefits – the media portrays people on benefits negatively, but now I know that if people are on Job Seekers Allowance or Employment Support Allowance that may be their only way to live and without that they wouldn’t be able to have anything. What is the main thing you have learnt at HOPE? I have learnt about the housing system and the benefits system; there are a lot of restrictions that HOPE has to work within which I did not know about. I have also learnt how to care and love the homeless. What have you found the most challenging? I find it most challenging when we aren’t able to help people, whether it be because of their age, their nationality or because of mistakes they have made in their lives, such as criminal convictions or drug and alcohol abuse. It is really tough sitting in an assessment and not being able to help clients. They often share about their lives and can get emotional and I have to try not to let it get to me too much. My highlight is seeing the people we CAN help. Has your initial view of the homeless changed since you started to volunteer? Knowing peoples’ situations and the stories behind how they became homeless means I can empathise. I have more understanding about homeless peoples’ situations. You encounter such a variety of backgrounds. Some people have just been evicted; some people have been on the streets for years. Why did you want a placement at HOPE? What words would you use to summarise your experience at the HOPE office? This entry was posted in Homelessness, Volunteering and tagged HOPE. Bookmark the permalink.